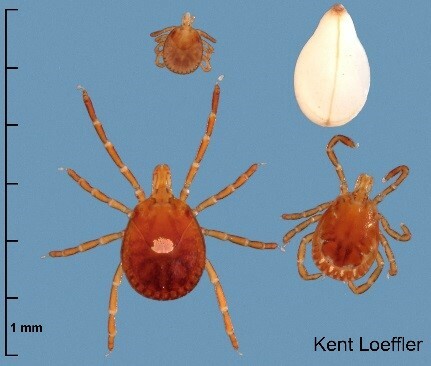 Species Identification - It is important to identify a tick in order to understand what disease-causing agents (pathogens) the tick is capable of carrying and transmitting. 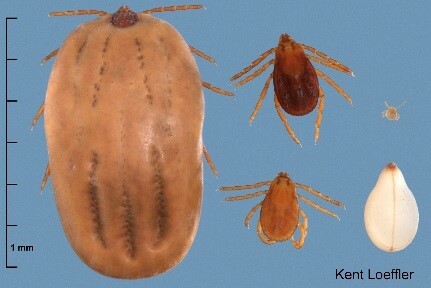 The species of all submitted ticks will be identified by our parasitology section. Molecular pathogen detection will be performed by our molecular section based on the tick species as listed below. For public and Cornell-affiliate submissions, the appropriate PCR testing is included in the submission fee and will be automatically performed. Veterinarians submitting ticks for identification should call the lab with any PCR requests once the species result is received. DO NOT WAIT FOR RESULTS OF THIS TESTING TO CONSULT A PHYSICIAN REGARDING POSSIBLE TREATMENT. POSITIVE RESULTS DO NOT NECESSARILY INDICATE THAT AN INFECTION HAS BEEN TRANSMITTED. Commonly identified ticks in North America that are potential vectors of human/animal pathogens and the molecular tests for detecting important pathogens are shown below. For other tick species, our subject-matter experts can suggest additional appropriate testing (for veterinarians) or will add tests as appropriate (for non-veterinarian submissions). The tick images shown below are courtesy of Kent Loeffler; each includes a sesame seed for size comparison. 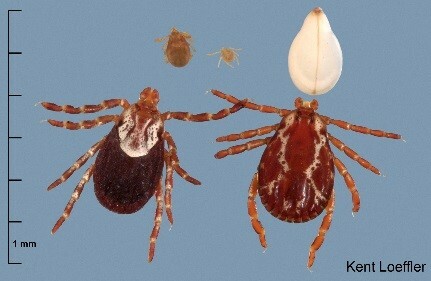 Ixodes scapularis (Black legged or deer tick) – This is the most common tick species identified in the Northeast USA. They will be tested for both the causative agents of Lyme disease (Borrelia burgdorferi) and Anaplasmosis (Anaplasma phagocytophilum) within 5-7 business days. Results for tests in development for additional tick-borne disease agents may be provided later, including Babesia microti, Borrelia miyamotoi, and powassan virus. Dermacentor variabilis (American dog tick) orDermacentor andersoni (Rocky Mountain wood tick) – These ticks will be tested for the causative agent of Rocky Mountain Spotted Fever and other tick-borne Rickettsiae using an assay published by the CDC that is currently undergoing internal verification. 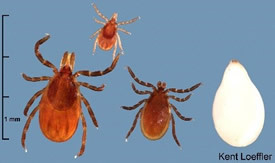 Rhipicephalus sanguineus (brown dog tick) - These ticks will be tested for the causative agent of Rocky Mountain Spotted Fever and other tick-borne Rickettsiae using an assay published by the CDC that is currently undergoing internal verification. Results for tests in development for additional tick-borne disease agents may be provided later, including Babesia canis, Ehrlichia canis, and Mycoplasma haemocanis. Amblyomma americanum (lone star tick) – These ticks will be tested for causative agents of Ehrlichiosis using assays currently undergoing internal verification. We may contact submitters in the future if any additional developmental tests are positive.